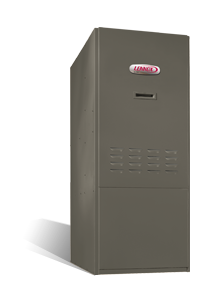 The Dave Lennox Signature® Collection SLO183V residential oil furnace offers variable speed for superior comfort. The SLO183V residential oil furnace works at different speeds to maximize comfort, while minimizing sound levels and energy costs. Quality components inside and out give you the assurance of long-lasting performance through Minnesota’s cold winters. An efficiency rating of 83% AFUE can save you over hundreds of dollars each year* compared to older furnaces. Efficiency ratings of up to 83% AFUE. Heavy-gauge steel heat exchanger—allows air to glide evenly over its smooth surface for maximum heating .efficiency. Variable speed operation—assures comfort, effeciency and considerable noise reduction. Innovative combustion chamber—constructed from alumina-silica ceramic fiber, provides quiet operation and high efficiency. Beckett burner—delivers super-efficient combustion for greater fuel economy. Heavy-duty fuel pump—provides quiet, reliable operation with fast shutoff of oil flow. 10-Year Limited Warranty on covered components. *This chart depicts potential energy savings you can expect from the SL0183V furnace, versus older furnaces with lower efficiency ratings. Criteria used in this example are 2,000 full-load heating hours, with a 80,000 Btuh heating design load and $1.90 per gallon for oil. Your actual savings may vary, depending on the weather patterns in your local area, local fuel rates and your individual lifestyle. Logical Heating and Air Conditioning serves the entire Minneapolis and St. Paul metro area including:Albertville, Anoka, Becker, Big Lake, Brooklyn Center, Brooklyn Park, Champlin, Corcoran, Crystal, Dayton, Delano, Golden Valley, Greenfield, Hamel, Hanover, Independence, Long Lake, Loretto, Maple Grove, Maple Plain, Medina, Monticello, New Hope, Orono, Osseo, Otsego, Plymouth, Ramsey, Robbinsdale, Rockford, Rogers, St. Michael, and Wayzata.